THE MOST WIDELY READ BLACK AUTHOR IS. . .
What a writer produces comes from the depths of “the never-never land of the spirit, of imagination; and all the arrows point away from the here and now,” said America’s most successful Black writer. His first published novel sold 500,000 copies within six months and more than a million before the year was out. It was turned into a major Hollywood production, The Foxes of Harrow, in 1948. Two more of his books hit the big screen in quick succession. All told, his 33 novels have so far sold more than 70 million copies. His name? Frank Yerby. Never heard of him? Not surprising, his characters were white, and most of his readers thought he was too! He was arrested once in his hometown Augusta, Georgia for walking down the street with his sister. She was lighter than him. The police thought she was a white woman. He went so far as to say that “the novelist hasn’t any right to inflict on the public his private ideas on politics, race or religion.” However, in his early years, Yerby, a contemporary and colleague of Richard Wright, wrote many serious essays, poems, and stories dealing squarely with racism and its impact, and was seen as a rising talent. But it earned him little. And so he turned to penning “costume novels,” to support his family, romantic tales set in times starring a white hero, a love interest and an appropriately nasty villain. Many took place in the Old South. Eventually, though, as the Sixties wore on and the civil rights struggle morphed into the Black Power movement, he began spinning tales with a Black protagonist. 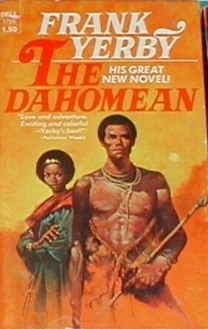 In fact, his greatest literary accomplishment is generally considered to be The Dahomean (1971), the coming of age story of an African prince and his brief rule, followed by his capture and sale into slavery. But even during the height of his costume novel days, he would always have a few Black, or other than white, characters in the background who were not altogether stereotypical. For example, in Foxes of Harrow, the white plantation owner’s right hand man, though a Black servant, nonetheless has his pride and dignity. 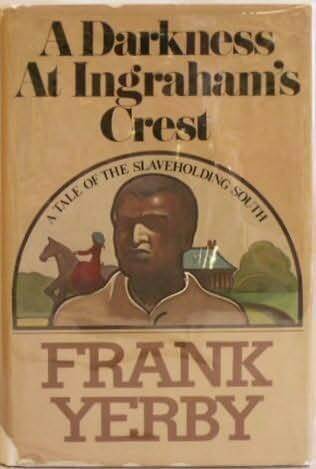 It is fascinating to compare that novel with Darkness at Ingraham’s Crest, written more than 30 years later. Both are set on a plantation before the Civil War, but this time it is the Black servant who’s the hero, cast almost as a near superman and the whites little more than bumbling idiots. It was as if he were getting his revenge for having to write for so many years from the other side of the fence, like a man who has passed for white all his life, finally feeling free to be who he is. But perhaps in his new found freedom going to the opposite extreme. His career was a metaphor for the psychology of much of Black America in the middle of the 20th century, complying with subjugation and then finally stirring and fighting back and proclaiming the counter myth of Black Supremacy. But Yerby never really fought back, he laid low in Europe throughout the storm. Why? “I just don’t have the time. It’s ridiculous. I should if I were a combative, courageous type militant who would put himself at the front of The Movement and go out and get himself shot in the belly a couple of times to advance things. So I’m a coward. Let’s face it.” Of course he was being facetious. But peel back the exaggeration and what do you find? That the African American writer whose vision touched more than any other, wrote for a white audience for most of his career. He dealt on the mythic plane without trying to turn things upside down like a Le Roi Jones or try to explain things like a James Baldwin, but to further the fantasies of low, and sometimes middle, brow readers in the accepted pantheon with a few tweaks here and there. That is why few African Americans even know the name, let alone any of the books, of the most successful novelist to emerge from their midst.